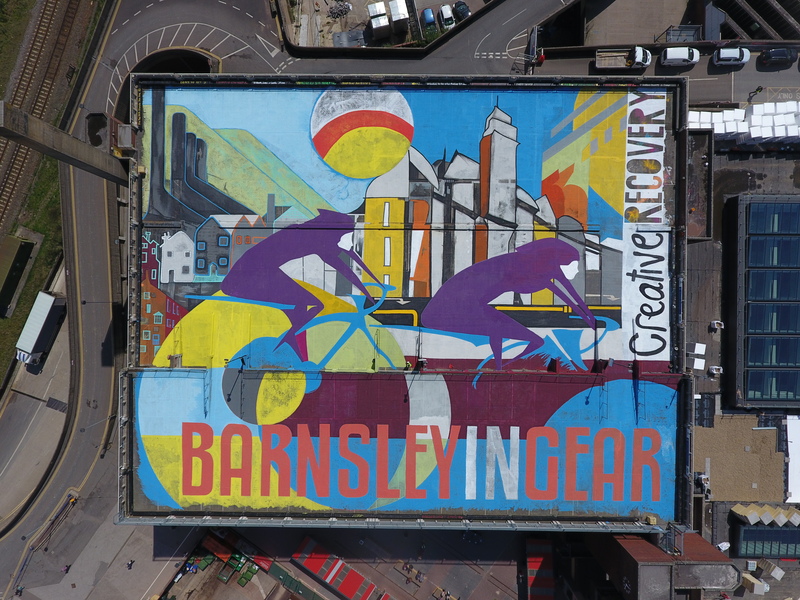 Creative Recovery were set their biggest challenge to date to create a large-scale urban land art masterpiece to celebrate Tour De Yorkshire and it’s start in Barnsley on Friday May the 4th, 2018. The land art was located on the top of Barnsley Market’s Multi-storey car park. Scaling 59 metres by 47 metres, totalling at a whopping 2773 square metres, the team used over 200 litres of paint, supplied by a local recycling scheme, to complete the job. This artwork was designed by ‘Recovery Through Art, Creative Recovery’s core visual arts project. 15 people were involved in the design process and over 30 supporters have gathered to help with the painting effort. The Graffitti futurism and Bauhaus Poster style influenced design features 2 cyclists speeding through the Barnsley townscape. The background reflects the town’s transition and regeneration as the cyclists travel from the industrial landscape into the new. The prominent Town Hall is featured behind the second cyclist. This project was commissioned and funded by Barnsley Council as part of the ‘In Gear’ project.